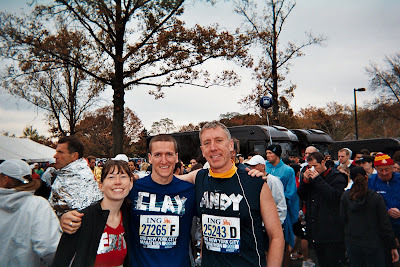 Alright, so it's been exactly a month since I ran the New York City Marathon, and I'm sorry for keeping you waiting. Needless to say it's been a crazy month with lots of fun happenings and news so that's my excuse, but more on that later, for now let me get into the marathon coverage. My friend Sarah lives in Brooklyn and was kind enough to let me crash on her floor the night before the run. It wasn't as bad as it sounds, she has an Areobed so I was actually quite comfortable, plus she made a killer chicken noodle soup. I didn't have long to enjoy the bed though as I had to get up around 4:15/4:30 so I could be out of the house by 5:00 am. Before I knew it I was up and waiting on a subway platform wondering what the day would hold. Just getting to the start line was a bit of an epic journey. I started in the Park Slope area of Brooklyn, a short 15 min car ride from the start on Staten Island. Unfortunately I couldn't drive to the start. I had to take 4 or 5 different subway trains, get on the Staten Island Ferry, take a coach bus to the starting village and then follow the masses to my starting area. Luckily, the man upstairs was looking out for me that day and blessed me with the nicest New Yorker I've ever met, Erin. Erin, a fellow marathoner, was waiting for the train on the same subway platform that I was in Park Slope. The only difference between her and I was that she was a local that knew where she was going and had run the marathon 5 times before. At the first subway transfer I kinda followed her to make sure that I was going where I should. I thought it best to say Hi and she kindly agreed to sherpa me to the start line. Soon, because of Erin's knowledge of the subway we arrived at the ferry. We boarded and our journey to the start was almost complete. By this time it was 6:49 am and I got a wonderful surprise text message from Becky letting me know that Chad and Heather had baby Gavin earlier that morning. It was great news and I thought about it a lot during the run. Finally, by about 8:30 am, over 3 and a half hours after it started, my journey to the starting village was over with. Erin and I milled around the enormous starting village for a bit, took in the pre-race church service and then met up with her other friend Andy. They were both great. Erin had some duct tape which she always used to put her name on her shirt so that people could cheer her on throughout the run. Andy and I followed suit, and it paid off big time through the whole race. People were chanting Go Clay, and cheering me on the whole time, I was very thankful that she had the tape and talked me into it. The chrome duct tape crew, I would normally label who's who, but I think you can figure it out. Before I knew it it was time for everybody to get into the respective corrals so we parted ways. Waiting for the start wasn't as bad as it could have been. The race was very organized and I didn't really get in my corral until about 10 minutes before the start so I didn't have to wait around too long. Suddenly there was a loud cannon shot, and we started inching towards to start. It was pretty crazy. The sheer volume of people participating was astounding. As we started to move, I shed the warm throw away clothes that I had been wearing (they collect all the clothes left behind and give them to the needy) and got ready to run. I was feeling good. I had warmed up a bit, the legs felt fresh, the weather was a bit overcast but the rain had stopped and it was in the 50s. It was all systems go and there was no turning back. I'll leave you hanging with that. More about the actual run tomorrow. Congrats on the NYC Marathon. 3:30 and change is a good time, for sure! Was this one of the years that Lance ran it? He's now talking about doing Ironman Hawaii in 2011 or 2012, depending on his professional bike racing. He'll probably run another NYC Marathon in the meantime for training - and go sub-3 again! Enjoyed reading your race post.